One way to traverse the coastline at St. Davids is to jump in and scramble along the rocks. ST. DAVIDS — From my perch overlooking the ocean, on a path no wider than my hiking boots, I could see sheer cliffs of volcanic rock running for miles in either direction, sea stacks dotting the shore, and long rocky peninsulas jutting out into the sea. Pastoral fields with grazing sheep ran from the path inland, across a gentle, treeless landscape broken here and there by stone walls, hedges, and farmsteads. A passing hiker stopped to point out a seal and her pups on a rock hundreds of feet below us, and I felt a tinge of fear and a touch of vertigo as I peered over the edge. “We try to keep people as close to the edge as possible because that’s where they want to walk,” Ian Meopham, a park warden in southwest Wales, later told me. Organizers designed the path to hug the coast and give walkers some of the best views along the way. If I followed this trail in either direction for just over 1,000 miles, I would end up right back in this same spot, thanks to the new Wales Coast Path, an 870-mile national footpath that opened last year. The path runs from the city of Chester in the north to Chepstow in the southeast. At these two spots, it connects to the Offa’s Dyke Path National Trail, a footpath that loosely follows the country’s eastern border with England, creating a 1,030-mile loop that makes Wales the only country in the world that can be circumnavigated on a continuous path. The coastal route cuts through small villages with tea houses and outdoor cafes, across sandy beaches with wide bays that attract dolphins and surfers, through wind-scoured areas where prickly gorse engulfs the hillsides, and past cliffs where daring folks scramble around in wetsuits and sneakers and leap into the ocean for fun. It also passes by a cathedral that was home to the country’s patron saint, St. David, and traverses a significant amount of private property and farmland. The distance between trailheads averages less than 10 miles, and some stretches are just a few miles apart, making the path accessible to hikers of various abilities. “You can walk in sandals with a handkerchief on your head and a sandwich in your back pocket, or with big boots and a pack, and tackle long 30-mile days,” said Meopham. 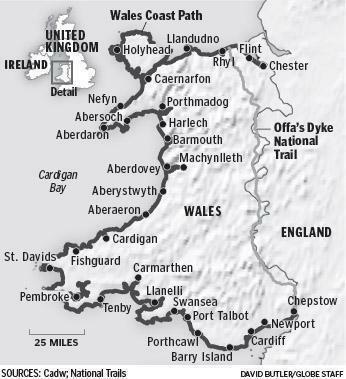 I traveled to Wales last fall to hike a few sections of the trail in the Pembrokeshire and Ceredigion counties along the west and southwest coasts. Since I was traveling with my friend Julie and my 15-month-old son, Sam, we rented a place in Pembrokeshire to call home for a few days: Ty To, a historic thatched house in the village of Tretio that had been beautifully and authentically restored, complete with whitewashed walls and a new thatched roof that took 3 miles of rope to reconstruct. It offered plenty of space, a big country kitchen, and great access to the path. Julie, not a hiker, took Sam to local playgrounds, on tidal pool adventures, and to St. Davids Cathedral where they explored the 12th-century cathedral and an enticing footbridge over a stream. They also took a short walk along the path to an old slate quarry in the hamlet of Abereiddi, which had recently drawn retired Olympian Greg Louganis and other divers for the cliff-diving world championships. Meanwhile, I enjoyed a couple of day hikes. One of my favorites in Pembrokeshire took me from the wild and windswept coast near Strumble Head Lighthouse south along 300-foot bluffs, occasionally dropping down to pebbly beaches and small bays that were only accessible by foot. The skinny dirt path wound through fields with hay bales and sheep on one side and patches of gorse or heather on the other, or else sheer drops to rocky inlets where seagulls scavenged for food. Other times it turned from dirt to grass and led to narrow outcroppings that gave wonderful views of the vertical striations in the nearby cliffs and the many rock formations along shore. I walked through a tunnel of vegetation near one beach and by an Iron Age fort and past millstones near an abandoned corn mill. Only about a dozen or so people passed by me all day. I ended the 14.1-mile hike in Porthgain, a small village that served as an important port for exporting slate and brick from the early 19th into the 20th century. Visit the Sloop Inn, a cozy pub dating to 1743 that serves everything from sirloin steaks to beer-battered cod with mushy peas. Several shuttles run along the coast at regular intervals, and owners of lodges like Yr Hafen (meaning “home”) near Porthgain will often provide drop-off or pick-up service along the path for their guests. Julie dropped me at trailheads and scooped me up after my hikes, but we soon discovered that the United Kingdom phones we had purchased didn’t work in remote coastal areas. Instead we communicated by taping notes to signposts at the trailheads. The next day, I hiked with Meopham around the tip of St. Davids peninsula overlooking Ramsay Island. The cliffs here were much shorter than in northern Pembrokeshire, yet the landscape was just as dramatic. We passed caves and stone arches carved out by the sea, and had clear views of notoriously treacherous Ramsay Sound and the area’s wonderful bird and sea life. “There’s a tide-ripped precipitous canyon here,” said Meopham, pointing toward the narrow channel between the mainland and the island. “This is like a conveyor belt for food, so you get nutrients mixing up from great depths. It draws gannets, kittiwakes, guillemots, razorbills, and puffins. Even in a driving rain, the area held such beauty. The trail passed the caves of an old copper mine, fanned out in a boulder-strewn field, included a few rocky scrambles, and crossed a pebbly beach. Some sections of the national path can accommodate cyclists, strollers, wheelchairs, and horseback riders, but most of it is more suitable for those on foot. “We’ve put in a lot of gates [to replace stiles] so people with duff hips can do it,” said Meopham, as we headed through Port Lysgi and southeast toward our destination in St. Brides Bay. Julie, Sam, and I spent a day visiting woolen mills and farm shops, and driving along one-lane roads lined with fiord-like embankments called Pembrokeshire hedge banks, which are made of turf and stone and can stand 6 feet tall. We then headed north to the Ceredigion region, known for its rugged coastline and its Blue Flag beaches, a designation given to exceptionally pristine beaches in Europe. About 60 miles of the national walkway runs along the ocean here, overlapping the well-established Ceredigion Coast Path, and passing through coves once favored by smugglers and settlements dating to the 5th century. Nigel Nicholas, a local ranger, hiked with me from the old fishing village of Llangrannog to New Quay, once a big ship-building town that is now a popular destination for beachgoers, surfers, and vacationers. We passed a flock of hearty Welsh mountain sheep as we headed past the Lochtyn Peninsula, where the rocks have magnificent veins of quartz. In one of my favorite spots, we hiked into a cove that looked like a natural amphitheater with its steep, sloping walls. Before descending to New Quay, we had to cross a treacherously narrow section of trail along a sheer cliff where one misstep would have been our last. Hikers can choose an alternate route, but I opted for the heart-pounder and crossed the hundred-foot section without any slips. That experience prepared my nerves for a final adventure along the coast path back in Pembrokeshire: cliff jumping. I had heard about this Welsh “sport” years ago and had always wanted to give it a try. 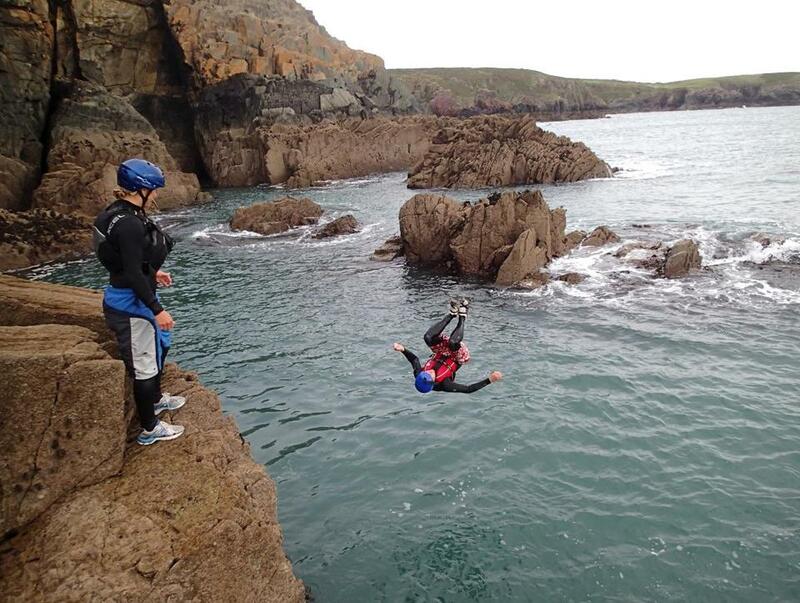 Coasteering, as it’s called, was coined by St. Davids native Andy Middleton nearly 30 years ago. “Anyone who grows up on a rocky coastline knows the joys of jumping off a cliff into the ocean,” said Middleton, who runs TYF Adventure, a company that offers climbing and water-based adventures around the region. Coasteering involves leaping into the ocean from cliffs and rocky ledges and then scrambling along the rocks, exploring seaside caves, bobbing in the surf, and playing around. “Ironically, it’s incredibly safe, though it doesn’t seem like it,” said Middleton. I spent half a day with a group of newbie coasteerers. We geared up in wetsuits, neoprene socks, old shorts and sneakers, helmets, and lifejackets, and then walked 20 minutes (it is a carbon-neutral company) through a residential area, past St. David’s birth site, and along a small section of the Wales Coast Path to reach the cliffs — just enough time for the nervous jitters to set in. “This is quite intimidating,” a fellow cliff-jumper said as we stood on a ledge overlooking the surging ocean. From my perch 20 feet high on a cliff, I could see dozens of kittiwakes nesting on a nearby rock, layers of pancake-like rocks thrust up onto their sides, and miles upon miles of clean, frigid ocean water. Walkers ambled along the national footpath behind us. Maybe hiking for 50 miles, often along cliffs with spectacular drops, had softened my fears. I looked out across the water, spread my arms, and took a flying leap.